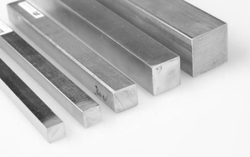 Our product range includes a wide range of super duplex square bar and duplex square bar. ASHAPURA STEEL AND ALLOYS is a 2507 (UNS-S32750) Super Duplex Steel Square Bar stockholders and suppliers, delivering in India. we are ISO 9001:2008 accredited and supplies 2507 (UNS-S32750) Duplex Steel Square Bar to internationally approved quality standards for applications. 2507 (UNS-S32750) Super Duplex Steel Square Bar have excellent quality to fully satisfy customer's requirements. The2507 (UNS-S32750) Super Duplex Steel Square Barsupplied by us are accepted by clients in various spheres of the industries ranging from basic industries such as Sugar, Paper, Textile, Engineering to more complex such as Oil & Gas, Petrochemical, Chemical & Fertilizers, Power Generation and Nuclear Industries. Looking for SQUARE BAR ?